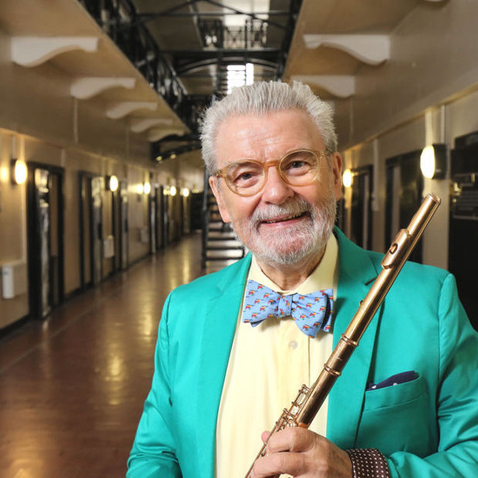 Globally renowned as the supreme interpreter of the classical flute repertoire, Sir James Galway is a consummate performer whose appeal transcends all musical boundaries. With over 30 million recordings sold worldwide, extensive international touring, frequent television appearances, tireless promotion of the arts and his passionate work in music education, Galway has been a household name for decades. His uniquely expressive interpretations of the flute literature span an extensive range of genres, from classical masterworks to high profile commissions, and provide the benchmark standard for all modern flautists. He has also collaborated on film soundtracks such as The Lord of the Rings, and partnered such popular artists as Stevie Wonder, Ray Charles, Joni Mitchell and Sir Elton John. The diversity of Galway’s repertoire reflects his impressive musical range, and has served to establish him as an artist of the very highest stature. A native of Northern Ireland, Galway began his flute studies in Belfast. At the age of 16, he was awarded a scholarship to the Royal College of Music, followed by studies at the Guildhall School of Music and Paris Conservatoire. At the age of 21, he embarked on his orchestral career in London’s major opera and symphonic orchestras. He took up the coveted position of solo flautist with the Berlin Philharmonic Orchestra under Herbert von Karajan in 1969, before becoming one of the very first flautists to establish an international solo career in 1975. He has a vast discography with 98 CDs to his name, having enjoyed recording contracts with Sony Classics and Deutsche Grammophon and most recently the RTE Label, featuring his recording of “Linen and Lace” by Bill Whelan. He maintains his busy international touring schedule, continuing to appear at major venues and festivals with many of the world’s top orchestras and conductors. Upcoming highlights for the 18-19 season include major recital and concerto tours of Europe (UK, Ireland, Italy, Switzerland & France) and the United States. A strong supporter of the arts and charitable causes, Galway devotes much of his free time to furthering music education, sharing his wisdom and experience with the musical generation of tomorrow. 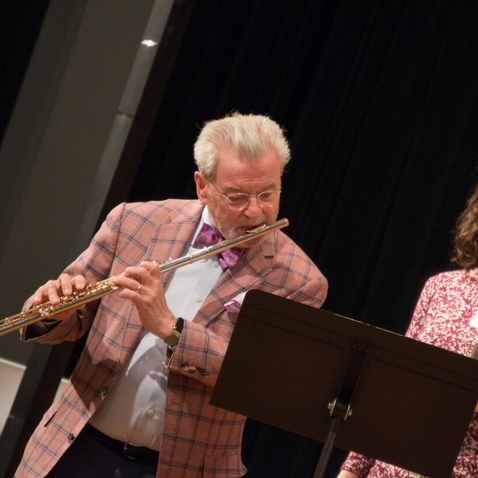 The Galway Flute Academy, Sir James and Lady Galway’s educational platform, enables them to nurture and mentor flutists of all levels through their various programs (www.galwayfluteacademy.com). Current teaching residencies include the Royal Irish Academy Dublin, Ireland; The Royal College of Music London and The Birmingham Conservatoire, UK; and The Frost School of Music - University of Miami, USA, where he was awarded an honorary doctorate of Music and presented the commencement address in May 2018. Galway continues commissioning new works for the flute, publishing articles, flute studies and books including a new publishing collaboration with Southern Music. To celebrate his legacy and commitment to flute players all over the world, the following flute companies have honored him with the release of a series of specially commissioned flutes - Gemeinhardt Flutes (Galway Crusader Flute); Nagahara Flutes of Boston (James Galway Nagahara Flute Series) ; & Wm. S. Haynes Co (James Galway Q Series edition). He has played for such dignitaries as Queen Elizabeth II, Pope John Paul II, President William J. Clinton, President George W. Bush, President George H.W. Bush, President Mary McAleese, President Michael D. Higgins, Irish Prime Ministers Enda Kenny & Leo Varadkar, Prince Charles, HRH The Princess Royal, The Empress of Japan, The Queen of Norway, Queen Sofia of Spain, Princess Diana, TRH The Earl and Countess of Wessex, TRH The Duke and Duchess of Kent, President Shimon Peres, UK Prime Minister David Cameron. He has shared the stage with an amazing array of entertainers including Stevie Wonder, Henry Mancini, John Denver, Elton John, The Chieftains, Ray Charles, Joni Mitchell, Jessye Norman, Cleo Laine and Andrea Bocelli. He performed with Pink Floyd in their memorable concert at the Berlin Wall (1990), was part of the Nobel Peace concert in Norway (1990) and performed at the G Seven summit hosted by Queen Elizabeth II in Buckingham Palace (1991). He also devotes much of his free time supporting charitable organizations such as SOS, FARA, Future Talent, Youth Music (UK), The Caron Keating Foundation, Lorin Maazel’s Châteauxville Foundation & UNICEF, with which he holds the title of special representative. Among the many honors and awards for his musical achievements are; the Gramophone 2014 Lifetime Achievement Award; the Grammy President’s Merit Award; Classic Brits Lifetime Achievement Award; The Hollywood Bowl Hall of Fame; The National Concert Hall Dublin Lifetime Achievement Award; Honorary Doctorate at Birmingham Conservatoire; Honorary Prince Consort Professor at the Royal College of Music in London, the Kennedy Center Gold Medal in the Arts, 2018 Churchill Award for services to Music and most recently Honorary Doctorate of Music at the University of Miami. He is also recipient of numerous gold and platinum CD’s. In December 2009, Sir James was awarded the honour of being made the first Artist Laureate of the Ulster Orchestra. He has been honoured twice by Her Majesty Queen Elizabeth II, with The OBE in 1979 and again in 2001 with a Knighthood for his services to music. Most recently he has been awarded the honour of Commander of the Order of Arts & Letters, one of the main distinctions among the ministerial orders of the French Republic. Galway lives with his wife in Switzerland and currently plays on a Platinum ‘Galway’ Nagahara Flute – especially commissioned for him.